Bushmills puts this in a bottle with a fancy green label bearing the motto "Matured In Two woods" - by which they mean bourbon and sherry cask. I'm all over secondary wood finishing (although apparently Bushmills does this "backwards" with a short sherry initial aging and then a long period in the ex bourbon cask (Woodford, i've heard). All this sounds wonderful. It's Diageo, so they'll chill filter and maybe add some color (not much - this stuff is pale) - but how can this go wrong, really? Nose: It's very shy and retiring. It takes quite a bit of air and time to come out of it's shell - but is nice when it does, with notes of malt, vanilla, sherry, some old cloves and a hint of mint. Entry is sweet and light with a malt mint and pink fruit medley (airs of grapefruit - without the citric acid). Midplate is gentle as milk with a thin grain body and the characteristic minty Bushmills flavor signature - just like you'll taste it in White and Black Bush - but without the grain alcohol. Indeed, in this young single malt expression I feel like we are at the root of this flavor profile. The mint turns a tad bitter at the finish - which is exceptionally brief. There's a hint of sherry sweetness at the end to offset it - but just a hint. The dominant word here is "gentle". Indeed, "meek" may be a better term. It's exactly the flavor signature of gentle Old Bushmills White, but with more malt in the midpalate - more malt grain foundation - and a richer mouth feel because it's free of the grain. It's perfectly pleasant. There's nothing wrong here. If you like the base Bushmills expressions you will feel right at home. Ultimately, a snooze. Get the 16 - which has more vinous influence and wood or stick to White or Black and save a few bucks. The 10 hews too close to the blends; splitting hairs. Nice review. I always have a look at that bottle when I'm in the store. I'm sure I'll give it a run sometime, but likely later rather than sooner. Thanks for the comment, whiskywriter!. Give my regards to Little Bitty Bits. Bushmills Malt 10 is fine - as long as your expectations are that you're going to get a little refinement on Black Bush - and not a big malt. They obviously know what they're doing because they sell of ton of that mild sweet whiskey. It's just not where I'm at. Bushmills makes better - but you have to pay for it. I'm really hoping that The Party Source restocks Bushmill's 10 minis so that I can try a bit of this whiskey without having to buy an entire bottle. Sounds nice in theory, but between the review and the weak bottling strength, I won't get my hopes up too much. Thanks for the tip about Party Source, Jordan. It's all about samples. 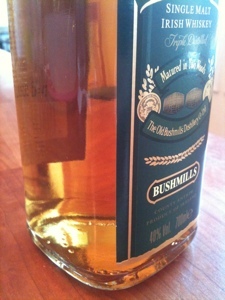 I know my review was lukewarm - but I really love Bushmills. I just greatly prefer the 1608 and 16 triple wood expressions. Hmmm... I may have to avoid this one since I don't really care for the taste of milk. Now if you said chocolate, vanilla, or strawberry milk, then I'd be all over it. Once again... excellent review! You certainly know how to describe what your tasting. 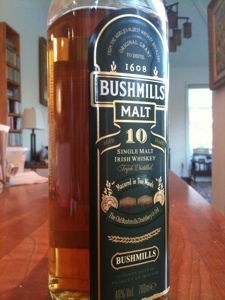 Bushmills Malt 10 is the warm milk of malt whisky - but it's still warm malty honeyed malt whisky; make no mistake. Thanks for the kind words - but I've got nothing on you - Mr. 100,000 hits!